The Volvo 440 and 460 are versions of a family car produced by the Swedish automaker Volvo Cars. They were built at the DAF factory in The Netherlands, and released in Europe in 1987 and 1989 respectively. The 440 was a 5-door front wheel drive hatchback and the 460 a sedan. 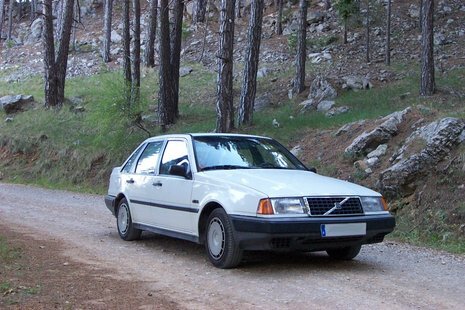 They shared many components with the already-successful Volvo 480, including floorpan, front and rear suspension, engines, transmission and braking systems. Safety has always been an issue of primary importance to Volvo, who have developed many features since adopted widely throughout the car industry. Crumple zones were incorporated into the design of 400 series cars, aided by a 'collapsible' steering column to help prevent driver injury in the event of an accident. Other nods to Volvo's safety-obsessed heritage included a high-level brake-light; a 'bulb blown' warning system; 'door open' warning light; adjustable seatbelts with pretensioners and a seatbelt reminder/warning light: all of which all came as standard on all models throughout the range. Safety was further improved on models from 1993 onward with the introduction of side-impact protection. This was virtually unheard of at the time, and was provided (again as standard) by the forerunner of the SIPS system used on all modern Volvo cars. The SRS (Supplemental Restraint System) system, which includes airbag, further uprated side impact protection and various hooks, straps and pulleys to secure items in the boot, also became available for the first time from 1994. 'Always-on' head- and tail-lights, which automatically switch themselves onto 'daylight running lamp' mode when the ignition is engaged, make it impossible to drive the car without at least the side-lights being lit. This idea, once considered quirky, has been looked upon more favourably of late. Laws requiring every car sold in the UK from 2010 to have 'always-on' lights were recently passed by the British parliament. The specifications of most models of 440 and 460 were relatively high when compared with similarly-priced alternatives. The list of options included as 'standard' grew and changed regularly throughout the lifespan of the car, varying from country to country and later also differing according to trim level. Furthermore, various 'special editions' were also introduced with equipment differing from that found as standard on all other models; making any more general comparison difficult. Heated front seats were found across the entire range, as was a 5-speed gearbox; adjustable seatbelt with pre-tensioners; folding two-thirds split rear seats; lockable glovebox with light; and boot and ashtray lights. 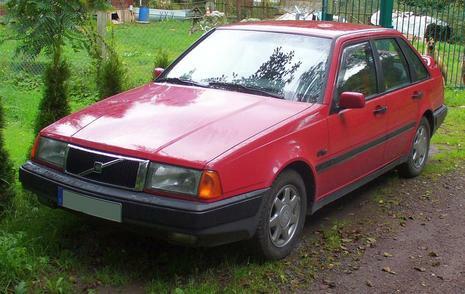 Options listed as standard on later models include anti-lock brakes (ABS); traction control; front fog lights; separate reading lights for passengers in the back (located in the rear grab handles and cleverly shielded from the driver's view); Radio\cassette player with 6 High-fidelity Blaupunkt stereo speakers; tinted UV-blocking windows; Map-reading lights; Graduated sun visor; Self-supporting (propless) bonnet; rear window wash/wipe; lumbar support; electric windows/mirrors; heated wing mirrors; central locking; tachometer. The driver's console on all models housed an array of warning lights, a rheostat and a Lambda sensor monitor. There were two generations of 440\460: the 'Mark 2' replacing the original model from 1994. Changes included a new bonnet and nose, new rear light clusters, body-coloured bumpers, a different grille and numerous new options of engine, spec. level and equipment. The changes made the cars resemble the very successful Volvo 850 model more closely. An uprated 6-speaker stereo system became standard across the range, which incorporated tweeters into the uprights surrounding the windscreen. Both 440 and 460 had a 1.7-litre Renault engine at launch, carried over from the Volvo 300 Series; this was available between 1988 and 1992 in four different versions with a carburettor, singlepoint fuel injection, multipoint fuel injection in the early GLT models and with multipoint fuel injection and a turbocharger with intercooler. The standard 1,721 cc powerplant sported 106 bhp and an announced top speed of 185 km/h (115 mph), which was marginally superior to some of its contemporary counterparts of the same class, such as the Volkswagen Passat or the Opel Vectra (their 1.8-litre engine only had 90 bhp). The turbocharged version offered 122 bhp (91 kW) and an announced top speed of 200 km/h (124 mph). These kind of performances put it on par with higher-end 1.8-litre engines, such as the BMW 318 or 518 of the time, and equalled the performance of a host of other 2.0-litre engines of the time. From 1992 the engines offered were substantially different, with the range now offering 1.6i (84 bhp), 1.8i (89 bhp), and 2.0i (110 bhp) naturally-aspirated petrol engines in addition to the 1.7-litre turbo option found in the mark 1 range. The 1.6 was equipped with multipoint-fuel injection; the 1.8 engine had singlepoint-injection and the 2.0 came with a choice of singlepoint- and multipoint-injection units - the older 1.7 turbocharged version however had more BHP. From 1994, the engines became slightly more powerful. Diesel versions also became available: a 1.9-litre Renault turbodiesel option (89 bhp) was offered, badged as either TD or Turbo Diesel, depending on which European market the car was sold in. Volvo also released a limited market 1.8 HTA - the "High Tech Auto," using a much improved electric belt assisted CVT auto transmission but it was short lived and not many models survive. Early cars were available in GL, GLE, GLT and Turbo trims. The GL trim level was basic; GLE was plush; and GLT was the 'luxury' trim level. GLT and Turbo were externally similar, both featuring lowered sports suspension and a large rear spoiler. Other trim levels were gradually phased in, such as limited edition Si and Xi, and Turbo later became simply an engine variant, rather than a full trim variant. From 1992, the range was the same for a year-and-a-half. As a result of the 1994 facelift, the range altered drastically. Trim levels were now: base, S (which was intended as a "family" variant), Si (intended as a "sports" variant), SE ("business" variant), GLT ("performance" variant) and CD ("luxury" variant) trims. An Li model also appeared in 1994, offering base spec with the addition of power steering (and, on later models, a sunroof). The later Si models and all GLT models were easily distinguishable from the rest of the range, due to the additions of sports suspension (making the car ride visibly lower) and a large rear spoiler. The GLT's specification was, however, significantly higher in featuring part leather upholstery, alloy wheels, ABS, traction control and an uprated stereo system as standard equipment. The SE was also slightly more distinguishable, having a small rear spoiler which it shared only with the limited edition ES pack model. The ES pack could be added to cars of any engine variant from late 1995. It featured sports suspension, 15" alloy wheels (see below), metallic paint, door sill decals, electric front windows, electric heated mirrors, front and rear armrests, ABS and immobiliser in addition to the small spoiler and an uprated stereo unit. The S model was also notable, having two fold-out child booster seats integrated into the car's rear seat, a dustbin incorporated in the dashboard and rear headrests. However unlike all the 300 series, the 440 had, at last split rear seats fitted. 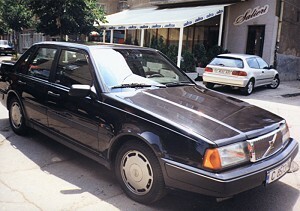 Specification of all later cars was high, with many featuring air conditioning (particularly as a result of a special offer operated by Volvo in the UK in 1995 where £100 deleted the standard electric glass sunroof from the car's specification in favour of air-conditioning and 15" alloy wheels identical to those fitted to Volvo 850 CD models, albeit with lower-profile tyres), remote central locking, electric aerial, electric windows, electric door mirrors and heated front seats. The line up was reduced (for example, the Si and GLT models were replaced by the GS, which had all of the Si's equipment and some of the GLT's, such as ABS) prior to production ceasing in 1997, when the Volvo S40 and Volvo V40 replaced the car. Parker's guide, an independent car price guide, said the following about the 440: "Family hatchback with reasonable space inside but plain looks. Drives well enough, though steering is heavy on cars without PAS. Cars from late '93 are safer and better equipped than earlier models, though all are solidly built." The 460 received the following evaluation: "The 460 substitutes a generous boot for the 440's tailgate but is otherwise identical. Liked by older motorists for perceived Volvo strength and safety, but lacks image and now sells for less than the hatchback. Power steering is a must - parking can be heavy going without it. As with the 440, models from late 1993 are best." Parker's also takes note of problems commonly reported by owners over many years. It summarises the issues found in relation to the 400 series as follows: "Some early cars suffered from erratic build quality; possible rust in body seams; gear linkage failure; overheating; coolant leaks; smoky engine when cold indicates piston wear; possible electrical problems." It should be pointed out that the data used to create this list came predominantly from owners of the earlier Mark 1 models of the car, with many of these faults becoming much more rare (or disappearing completely) with the introduction of the Mark 2. An auxiliary water pump was added to all non-turbo models from late '93, along with 'run-on' electric radiator fans, which continued to run after the engine was switched off in an attempt to fix the overheating/coolant problems. Build quality was much improved on Mark 2 models, as was the rust-proofing the cars received. A browse around for remaining 400 series models reveals that rear wheel arches are the only place now routinely troubled by rust. Electrical gremlins did unfortunately persist throughout the life of the range, but these usually affected only the non-essential 'accessory' circuits, and were limited in nature. Fuel gauges, dashboard bulbs (but not those on the main instrument panel), interior lightbulbs and the driver's heated seat are the most commonly-cited weak points. Ironically, the sheer number of electrically-operated items, bulbs and systems in the car may be at least partly to blame for any apparent problem: with an increased amount of bulbs and systems comes an increased requirement to replace those bulbs or systems when they blow. This may lead to the perception that bulbs are blowing more frequently than actually is the case: this effect being easily explained away by statistics. Some have found that the engine and gearbox set up on all engines, with lots of low-end torque, makes the car accelerate surprisingly quickly from a standing start at traffic lights, tempered by an increased number of gear changes when driving around town. The 'little touches' added to the Mark 2 cars mounted up into a much more pleasant overall experience for owners. Bonnets that automatically locked into the 'open' position (without use of a prop-rod), improved security, better engines, 6-speaker audio system well positioned to make the most of the sound, better soundproofing and more adjustable, comfortable seats are just a few of the changes made. As the first front-wheel drive family Volvo, the car marked a turning point in the company's history. It is worth noting that almost all completely new Volvo designs launched after the 440 have been front-wheel drive. Its styling with a distinctively long bonnet is unusual, but certainly has 'character'. Later models with the integrated grille were perceived to look classy when compared with their mid-1990s competitors, again benefitting to some degree from the positive connotations created by the 400 series' connection to the 850. The 460 however did not benefit from split rear seats (only benefitting from a ski-hatch through its rear elbow rest) hence it's bigger boot compared to the more versatile hatchback and offering similar crash protection. A year after the launch of the Volvo 440, the 400 Series was expanded with an additional variant, a 4-door sedan known as the 460. The Volvo 460 had the same basic technical structure and layout as the 480 sports coupe, which meant that it shared the sports model's transverse engine and front wheel drive, as well as the excellent handling and roadholding for which the 480 was so renowned. The 460 was available with a number of different 4-cylinder engines ranging from 1.6 to 2.0 litres. All featured a single overhead camshaft and were developed from the same engine series. For the 1994 model year, the 460 underwent a major cosmetic redesign to bring it more into line with its larger and more powerful sibling the Volvo 850. 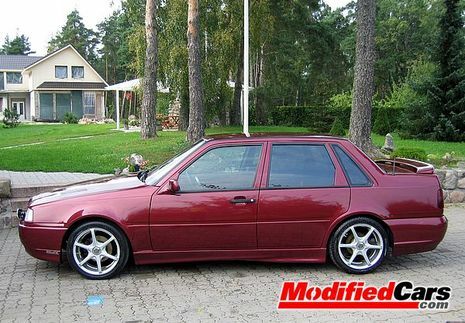 In fact, the Volvo 460 was often regarded as something of a smaller version of the 850. The Volvo 440 had the same basic technical structure and layout as the 480 sports coupe. This means it shared the sports model's transverse engine and front wheel drive, and of course it reaped the benefits of the 480's excellent handling and roadholding. During its model life, the 440 was available with a number of different engines ranging from 1.6 to 2.0 litres. All were 4-cylinder units with a single overhead camshaft, and all were developed from the same engine family.